It Creates the Right Kind of Drama. With uplighting, you decide what mood you set. Whether you’re looking to add an elegant glow to your wedding reception or whether you want to add a dramatic pop of color and life to the school dance, Diamond Dan Productions can make it happen. We are capable of transforming your setting into a stunning space. Allow Diamond Dan Productions to help you create an enchanting ambiance that will change your guest’s experience. It Highlights the Best Features of Your Venue. Say you are getting an ice sculpture for your event. You want people to see it, right? Or say you spent a fortune on a beautiful 3-tiered wedding cake. Make it more prominent and memorable with the proper uplighting. Whether it’s an ice sculpture, elaborate wedding cake, or another unique feature, make sure to show it off the right way! Direct the focus of your party guests through skilled uplighting techniques. Diamond Dan Productions can make this happen. We are skilled at putting the spotlight on things that matter. It Adds That Personal Touch to Your Party. 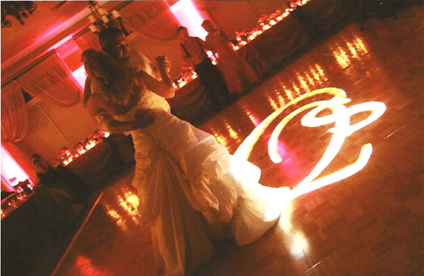 Do you want the initials of the bride and groom to light up the dance floor? Do you want your company logo projected on a feature wall? With our advanced uplighting, we can customize light designs to suit your needs. Wow your guests with the thought and attention you put into your party or event. With Diamond Dan Productions, our uplighting will deliver the impact you want it to have. Choose Diamond Dan Productions. If a picture is worth a thousand words, our lighting photos say it all. Interested in our other services to top off your event? See what we offer: Photobooths, Weddings, Ceremonies, Corporate Events, Dances, & Karaoke. Contact us today to see the possibilities! 309-657-6264.